Paper crafters and scrapbookers rejoice! Fiskars is coming out with a cleaner, crisper, time-saving method to do your stamping. 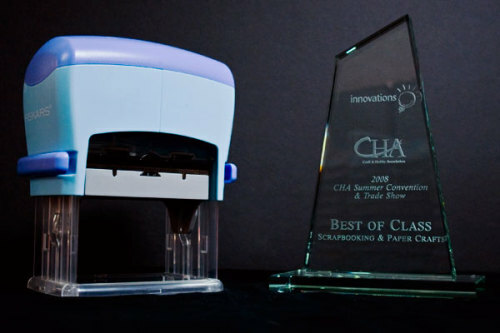 Fiskars' new patent pending device is called the Push and Print Stamp Factory and it just won Best Of Class for Scrapbooking and Paper Crafting Innovation from the Craft and Hobby Association. The Push and Print Stamp Factory allows the paper crafter to insert any clear acrylic stamp into the "factory." Then, the crafter can select any one of Fiskars' ink pads into the unit below the stamp, and lock it into place. There is no self-inking necessary. The Factory does the inking for you each time you push down on the unit. For more information, visit FiskarCrafts.com. we use things *exactly* like that at work, only we can't change the stamp, I don't think. but it would be easy enough to change. you can change the ink thought, and tomorrow when I go to work I'm gonna see if you actually can change the stamp. I want one. What is MSRP? Are more inks in the works? What is size limit for the stamps? Is it available in stores yet?